Boeing is breaking the rules of crisis management and making what may well prove to be a bad “bet the company” wager. The gold standard, as most readers know well, is Johnson & Johnson’s response to 1982 tampering with its product, Tylenol. Seven people died in Chicago due to Tylenol containers having been put on the shelves with cyanide pills inside. A few more people died in what were believed to have been copycat incidents. Tylenol was Johnson & Johnson’s most important product and then the nation’s leading OTC painkiller. Johnson & Johnson immediate issued warnings, telling consumers not to use any Tylenol until the company had ascertained how big the tampering problem was. It recalled all Tylenol nationwide, cooperated with the police, and set up an 800 number for consumers. Johnson & Johnson re-introduced Tylenol with triple-safety packing that has become an industry norm. Even though its market share plunged during the crisis, it rebounded to an even higher level a year later. It isn’t hard to infer that this is not how Boeing is setting its priorities. It is important to recognize that the global grounding of the 737 Max is the result of trying to compensate for questionable, profit-driven engineering choices by adding a safety feature (the MCAS software system) and then going cheap on that, in terms of selling planes not kitted out fully and acting as if it was perfectly fine to install software that could take control of the plane and barely tell pilots about it. Two paragraphs more than 700 pages into a manual does not qualify as anything approaching adequate disclosure. Boeing is taking steps that look designed to be adequate, when given the damage done to the 737 Max and its brand generally, this isn’t adequate. No one has any reason to give Boeing the benefit of the doubt. The scale of this failure is so large that it’s called the adequacy of FAA certifications into question. Until this fiasco, aviation regulators deferred to the judgment of regulator in the country where the manufacturer was headquartered. But with China embarrassing the FAA by (correctly) being the first to ground the 737 Max, foreign regulators will make their own checks of Boeing’s 737 Max fixes….and that practice may continue with other US-origin planes unless Boeing and the FAA both look to have learned a big lesson. So far, Boeing’s behavior says not. One does not have to do much in the way of review to see that Boeing has lost the plot. Boeing compromised on sound engineering with the 737 Max. Recall the origins of the problem: Boeing was at risk of losing big orders to a more fuel-efficient Airbus model. Rather than sacrifice market share, Boeing put more fuel-efficeint, larger engines on the existing 737 frames. The placement of the engine created a new safety risk, that under some circumstances, the plane could “nose up” at such a steep angle as to put it in a stall. The solution was to install software called MCAS which would force the nose down if the “angle of attack” became too acute. Again and again, in discussions of what has gone wrong with Boeing’s 737 Max planein two deadly crashes within five months, an unusual word keeps coming up: kludge. In the case of the 737 Max, it’s the combination of how two separate problems interacted—a plane whose design introduced aerodynamics issues and what now appears to have been a poorly designed anti-stall system—that seems to be drawing many to turn to Granholm’s term. The problems were compoundedin many ways, including by the fact that pilots were not told of or trained for the Maneuvering Characteristics Augmentation System (MCAS) before the Lion Air crash, which killed all 189 on board. That no one who wrote the MCAS software for the 737 MAX seems to have even raised the issue of using multiple inputs, including the opposite angle of attack sensor, in the computer’s determination of an impending stall is mind-blowing. As a lifetime member of the software development fraternity, I don’t know what toxic combination of inexperience, hubris, or lack of cultural understanding led to this. But I do know that it’s indicative of a much deeper and much more troubling problem. The people who wrote the code for the original MCAS system were obviously terribly far out of their league and did not know it. How can we possibly think they can implement a software fix, much less give us any comfort whatsoever that the rest of the flight management software, which is ultimately in ultimate control of the aircraft, has any fidelity at all? No – this isn’t about “planes that fly by themselves.” It’s about an airplane manufacturer that put engines on an airframe they weren’t designed for, having to add a flight control override to guard against said airplane’s new tendency to nose up, and then adding insult to injury by driving that system with a single sensor when two are available. Oh – and charging airlines extra for the privilege of their pilots being told when one of those sensors is providing bad data. 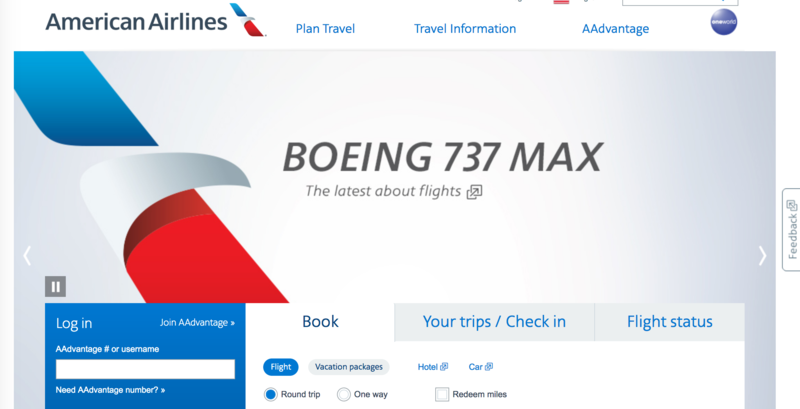 I came back to the page later to make sure I hadn’t hit the 737 Max message randomly, by loading the page just when that image came up in a cycle….and that doesn’t appear to be the case. I landed on the 737 Max splash a second time. This result suggests that American has gotten so many customer queries about the 737 Max that it felt it had to make providing information about it a priority. If you click through, the next page explains how all 737 Max planes have been grounded, that American is using other equipment to fly on routes previously scheduled for those planes, but it has still had to cancel 90 flights a day. Officials investigating the fatal crash of a Boeing Co. BA 0.06% 737 MAX in Ethiopia have reached a preliminary conclusion that a suspect flight-control feature automatically activated before the plane nose-dived into the ground, according to people briefed on the matter, the first findings based on data retrieved from the flight’s black boxes. Boeing is doubling down on its mistakes. The lesson of the Tylenol poisoning is that if a company has a safety problem, even if it isn’t its fault, it needs to do everything it can to rectify the defects and protect customers. If there is any doubt, the company needs to err of the side of safety. Here, unlike with Johnson & Johnson, the failings that led to 737 Max groundings all originated with Boeing. Yet rather than own the problems and go overboard on fixing them to restore confidence in the plane and in Boeing, Boeing is acting as if all it has to put in place are merely adequate measures. Boeing Co said it will submit by the end of this week a training package that 737 MAX pilots are required to take before a worldwide ban can be lifted, proposing as it did before two deadly crashes that those pilots do not need time on flight simulators to safely operate the aircraft. I’ve never flown Southwest and now I will make sure never to use them. I hope the pilots in our readership speak up, but as a mere mortal, I’ve very uncomfortable with pilots being put in a position of overriding a system in emergency conditions when they haven’t even test driven it. When I learn software, reading a manual is useless save for learning what the program’s capabilities are. In order to be able to use it, I have to spend time with it, hands on. Computer professionals tell me the same thing. It doesn’t seem likely that pilots are all that different. In other words, Boeing’s refusal to recommend simulator training looks to be influenced by avoiding triggering a $31 million penalty payment to Southwest. This is an insane back-assward sense of priorities. Boeing had over $10 billion in profits in 2018. A $31 million payment isn’t material and would almost certainly be lower after tax. Boeing does not seem to comprehend that it is gambling with its future. What if international flight regulators use the Max 737 as a bloody flag and refuse to accept FAA certifications of Boeing planes, or US origin equipment generally? Do you think for a nanosecond that the European and Chinese regulators wouldn’t use disregarding the FAA as a way to advance their interests? Europe would clearly give preference to Airbus, and the Chinese could use Boeing to punish the US for going after Huawei. Boeing’s comeuppance is long overdue. The company’s decision to break its union, outsource, and move to Chicago as a device for shedding seasoned employees was a clear statement of its plan to compromise engineering in the name of profit. Something like the Max 737 train wreck was bound to happen. And yet we do not see anyone suggesting the obvious solution to this problem; eliminating the 737 MAX type of aircraft altogether. The crashes of the early de Havilland Comet commercial jet aircraft all but destroyed English commercial jet production. Boeing should suffer a similar fate as de Havilland. Indeed, since the Comet crashes were the result of a previously unsuspected design flaw, and Boeing’s problems are self inflicted, Boeing should suffer a more drastic punishment. I understand that it can take up to ten years to develop a new aircraft, but the basic design of the 737 has been around since the Jefferson Airplane’s “White Rabbit” (!). Given that Airbus, like Avis, was going to be trying harder for more market share, was it totally beyond Boeing’s capacity to develop a follow-on for the 737 over the past, say, 20 years? Boeing were designing a follow-on to the 737, but panicked when the A320Neo came and went for the MAX instead as they could deliver it much quicker and cheaper than a new aircraft. What I don’t know is if they are still working on a replacement or if they shelved the plans entirely. If its true that they are another example of a once great engineering company enslaved to the quarterly results, then it may well be that all work on the replacement stopped when they put their engineers to work on the MAX line. If that’s the case, then they really are screwed. Ten years is an absolute minimum to get a brand new aircraft delivered to customers from a standing start. Hewlett-Packard is another example of this. Obviously it’s the fruit of the neoliberal mindset, where speculating on financial instruments is the highest and only calling for human beings. After the 787 delays, I doubt 10 years is enough for Boeing to get a plane from conception to delivery. The problem with a new design is the production rate of 60-70 planes per month. It will take years and massive investment to get the supply chain to that level (after about 8 years of development, which is the “easy” part). In the meantime declining cash flow from your bread and butter production line, which is being replaced, and which finances these investments. All that during a market boom with your main competition not being able to keep production up with demand, and new competition ready to enter the market. The alternative: an old updated design with a supply chain in place, which quickly captures a large part of that market, undercuts new entrants (c-series in particular), and with a fraction of the investment. The 737 was designed to be low to the ground because it was to serve small airports where the passengers had to climb stairs to enter (which I remember doing at Burbank and Ontario years ago) The 737 Max is what you would get if the 757 and 737 had a child. The newer versions of the 737 have nearly twice the max takeoff weight of the original, but with the same landing gear and nearly the same wing area. Perhaps a shorter version of the 757 would have been the correct move, but Southwest would have screamed bloody murder. Pilot and aircraft owner here. Let Southwest scream bloody murder. Times change. Their planes should change too. And I’m speaking as a very loyal Southwest customer. Saw an image of a lot of Southwest 737s parked on a tarmac together at some airport. There must have been at least two dozen there. And I recalled how someone said once that planes only make money when they are in the air. Pity the staff working over at Southwest then. My understanding is that longer landing gear was not an option, not just for weight reasons but for the need to reconfigure the entire belly of the plane. You need different everything: motors, bay doors, etc. If you have a chance to look at the underside of a 737 this is pretty easy to see – I got up close and personal with a 737-200 when I was training to be an Aircraft Maintenance Engineer. If it had been at all feasible Boeing would have done that ages ago when it became obvious that engines were going to become much larger in diameter than the original JT-8D’s. It was intended to be usable at unimproved strips do it was available with a complex airstair under the main entrance. The one at my school had it installed – a very complex mechanism especially compared to the rear airstair on a 727. Various other features are there for these sorts of operations too though the wing/engine/gear layout wasn’t driven entirely by these considerations. They actually did the soft-field certification at the airport I fly gliders out of. The doubling down on “no extra training necessary!” is terrible. It’s going to bite Boeing hard in the rear. The problem for airlines is the need to have more energy efficient aircraft for both cost and environment pressure reasons. The 737 max is a response to the airbus 321neo, but as I understand it, Airbus does not have the capacity to takeover cancelled orders for the 737 max. Do airlines stick with older 737 or brazen it out with Boeing that the max problems have been resolved? And passengers. I imagine they will fall into the brackets I will never fly on a 737 max, or I trust Boeing/airline, or a fatalistic if my number is up, my number is up’. I regularly fly with Norwegian in Europe. However I for one will never fly a max and will now prefer SAS with the 321neo. As for ryanair, that has max on order, if they take delivery, bye bye them. Maybe the new Russian and Chinese versions can be an option? Or will Trump sanction any airline brave enough to order them instead of Boeing? Airbus probably can’t produce enough Neo to make up for the shortfall, but they essentially own the Bombardier C-Series now (ironically, made in Mobile, Alabama and relabelled the Airbus 220) which could prove an excellent investment by Airbus. There are four other potential competitors – the Sukhoi Superjet (which is a little smaller so may not be a direct replacement), the Irkut MC21, The Embraer E-Jet from Brazil, and the Chinese Comac C919. The French have a significant input to the Sukhoi, while Bombardier were involved with the Comac. None of those are direct replacements (they are generally smaller and shorter range), but they might suit many airlines who need aircraft quickly but won’t touch the Max. 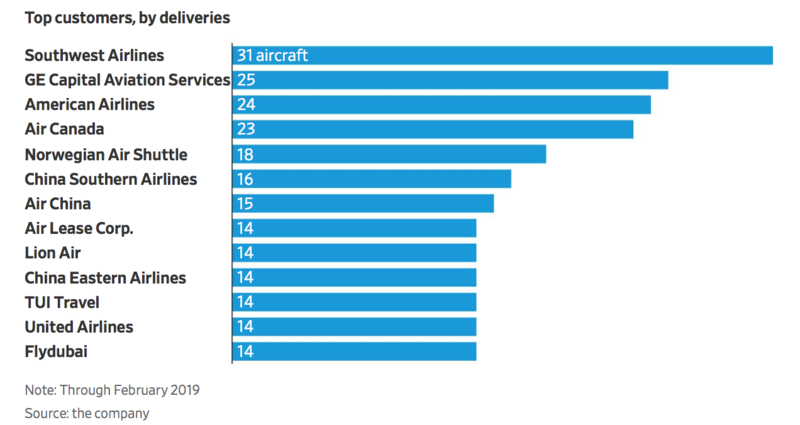 None of the above can match the Boeing or Airbus for state of the art engineering, but they are cheaper to buy, so they may well now be more attractive to budget airlines and third world airlines. The big one to look out for is Ryanair – they’ve long been Boeings biggest customer outside the US and have stuck with 737’s consistently. They will do their usual tactic of demanding huge discounts every time Boeing look weak, and no doubt they will do the same now. But they may decide to look elsewhere (especially as they don’t really need the longer range as they operate exclusively in Europe). If they opt for something like the A220 or the Irkut, then that will be an enormous blow to Boeing, because others will follow Ryanairs lead. PK, you said that the Sukhoi Superjet had significant French input. Does that mean physical components as well? If so, I would be surprised after the Mistral amphibious assault ships fiasco. On this topic, I saw this week how the French were taking out German components out of joint French-German weapons systems and replacing them with French ones as the Germans are wary about arming countries like Saudi Arabia and so have a say in these joint systems much to the disgust of the French, hence the swap-out so the French can continue to sell these systems. I was thinking of the engines, which are a joint project between a French and Russian company. Ironically, the core of the engine for the Sukhoi is the M88, the engine the French developed for the Rafaele fighter. The French are exceptionally good at using military research to help their commercial companies, and vice versa. The French are also very ruthless (i.e. immoral) when it comes to export sales. This is why they usually only partner with the British, as they know the British share their rather loose definition of ethical policy in weapons sales. And they insist on Frenchifying their systems as much as they can so there is nobody to interfere with sales. Contrary to the ethics of the US in weapons sales, you mean? I wonder what the people of Yemen would have to say about this. From what I can see from the outside, both the c-series and mc21 are much more advanced than Boeing’s offering (737!) or even Airbus (an updated 80s plane). Problem is: none of them even remotely produces enough planes. Planned yearly production rates for the MC 21 is similar to the monthly 737 max production rate. C-series is in a similar situation. Sustained production rate drives costs down. And ramping up is expensive and challanging. Comac is something else altogether. There current offering arj21 has reliability problems. Even Chinese airlines send reluctant to buy from them. Secondary problem: no global support network exists for those alternate planes either. Sukhoi would have been capable of producing more SSJ-100’s, but Interjet has found them difficult to operate when they are the only customer in the Americas. Irkut and Comac will have the same problem. Thanks for the shout-out for Mobile, my hometown and current location. Airbus has been an incredible boon to the local economy and IIRC they are building a new assembly line, likely for the Bombardier plane. I have nothing but crocodile tears for Boeing. Some years ago they were competing with Airbus for a new Air Force refueling tanker. This was the original contract that was going to give Airbus the wherewithal to build an assembly line in Mobile. Airbus was proposing an existing tanker that was used by other countries and had been tested and flown for a few years. Boeing proposed refitting the 767, IIRC, as a tanker. Airbus had a much better proposal and cheaper as well. They won the first round of the bidding and the Air Force was ready to sign the contract, but then Boeing released its lobbying hounds on Congress and had them overrule the Air Force. Fortunately for Mobile, Airbus had already committed enough resources and we had certain advantages to offer, like one of the longest runways in the country, that they decided to build an assembly line here for some of their passenger jets. Kludge translates in spanish into “chapuza” and in my view expresses very well the “solution” that Boeing brougth to the 737 Max. Regarding the FAA I have read in spanish press that Daniel Elwell declared in the congress (translated from spanish) that “I can’t believe that airline companies tried to save a few thousand dollars on a feature that increases safety”. This is a bad try to shift blame from Boeing to airline companies and if anything will reduce (eliminate) the international confidence on FAA regulations. Small side note: “Kludge” is primarily used in software only because most engineering now is software work. In fact the word is well known and routinely used by engineers in all fields and certainly has been since I learned it in engineering school in the 70’s. It’s so common that I didn’t realize it wasn’t widely known outside engineering. Speaking of Spanish, did you all know that Southwest’s planes are maintained in El Salvador? Another reason to boycott them. They are too cheap to pay American, English speaking unionized aircraft mechanics belonging to International Association of Machinists and Aerospace Workers. I’m sure the guys in San Salvador think they are pretty good mechanics. Maybe they can read the FAA special notices without translation? These aren’t Chevies they are working on. p.s. How much of Boeing’s software work was done in India or China? I am in IT and have had to work with the folks from India. I am in the financial services area specifically insurance so I have no knowledge of aircraft software, however from the discussion about this I would bet that a lot of the software was written offshore – it sure sounds like it anyway. In my business there are many days when I tell myself “Thank god I I don’t own any of the insurance products I work with”. It sounds as if I need to start thinking that way about other products as well. The bottom line for the executives who run these companies is they Just.Don’t.Care. Any way to make a buck is fine with them. Having troubleshot avionics and system faults with them I think they are. I’ve also had to work with sprocket-heads in the US. A lot of the US union mechanics (technicians as they are called now) are empty jackets with limited capabilities. Most are not as professional as their Asian and European counterparts. Non-union shops in the US can be a dog’s breakfast. European technicians laugh at the FAA Airframe & Powerplant Mechanic certificate testing, suggesting it comes in the Sunday newspaper. And that migth, precisely the difference between the Tylenol and the 737 MAX affairs. Boeing knows it is their fault and the blame feeling prevents them to act as rationally as Johnson&Johnson did. I think the primary issue is the 737 Max represents over half a trillion dollars in orders stretching out perhaps a decade or more. I think it has been reported that the 737 Max was going to be 30% of Boeing’s profits. The plane cannot be “fixed” in a timely manner as J&J was able to do with Tylenol. New packaging for Tylenol took a few months to develop and roll out. If J&J did nothing and everybody else in the market had new packaging, J&J’s consumer business would have been destroyed. The problem for the 737 Max is a serious design flaw. A true fix for the 737 Max doesn’t really exist, does it? I think this explains Boeing’s reticence. Hopefully the traveling public will remember and boycott these planes. At Boeing’s factory in Renton, Washington, managers told engineers working on the MAX, including its anti-stall system known as MCAS, their designs could not trigger Level C or D training designations from the U.S. Federal Aviation Administration, the three former Boeing employees and a senior industry executive with knowledge of MAX development told Reuters. Otherwise, pilots would have to spend time in simulators before flying the new planes. Managers telling this to engineers before a plane is designed is one thing. Telling it to them after the plane been designed but while its user interface is being designed is outrageous. This indicates the MCAS software was developed in Renton, rather than being outsourced. So why the newbie design? Seasoned engineers would never have designed a product like this. All engineers know that requiring perfection in either components or operators is the Road to Perdition. As the saying goes in Aerospace regarding software engineers, if you could work at Apple or google or some other silicon valley place ….why would you work for an Aerospace company? Aerospace does not get the best and brightest Software engineers. Still this was a systems engineering and airworthiness breakdown at it’s core. Software engineers design to requirements, systems engineering requirements should have been derived from the airworthiness requirements. People keep missing how important it was that Boeing sold the FAA on .6 degrees max authority for MCAS, when in reality they ended up going with 2.5 degrees and the system reset itself every time the pilots hit a kill switch on the control yoke. I don’t think the report “indicates” the software was developed in Renton rather than Kolkotta. If they were telling the engineers in Renton this, they might have been telling the guys in New Delhi the same thing. Another software guy here, and someone who got a bunch of grey hair dealing with outsourced development on certain subcontinents. I would recommend on focusing on who wrote the software and not where it was written. Yes, in general the where correlates to the how on the surface, but I would not be surprised at all if what happened was that someone was hiring cheap, potentially inexperienced software engineers with no or not much experience in building critical systems. As Tim above mentioned, aerospace isn’t exactly at the forefront when it comes to pay levels so they might be tempted to cheap out a bit. Combine that with the “god mode” problem that a lot of inexperienced software developers have – hey, it’s just software, so I’ll build WordPress plugins today and flight control software tomorrow – and it doesn’t surprise me that systems like these have problems these days that we didn’t see a decade or two ago. Part of this is a reliance on more software, but the other part is the usual neoliberal cheapening of systems building. Oh, and if building the software was outsourced to India, then there is always the cultural component where they will build you exactly what you asked for, if it makes sense or not. So while I agree that crappy software plays it part in these issues, IMHO the problem is higher up in the chain of command. I’ve just quit an engagement In a legacy financial business after 8 mths, it’s easy to quit at 65, having made ones stash already some time ago. I watched the outsourcing phenom in the USA since the late 90s., I’m subcontinent / Brit origin myself. This time around in a gig I’ve seen several changes. Man, they treat contractors like dirt, crowded 36 to a room, rows of desks along corridors ! The entire business culture is hire vendors, and perpetually, casually, always find somebody to blame, more and more and more meetings. It all comes down to billing hours. And everybody is steeped in this culture, of justify your existence, and yeah many many managers are originally from the outsourcing/ offshoring environment, i.e subcontinent origin. My gig was Business Transformation. My final presentation would have been “It wasn’t like this in the 80s, start taking pride in your work, whether as HR, facility manager or in IT”. Instead mindful of my 40/ 50 yr old colleagues, who don’t have the luxury of principles that I do, and that they won’t listen to me anyway, I gave my standard anodyne,buzzword filled pressie. Now I’m going to reflect on what I’ve seen.There really is something deeply wrong in the state of Denmark. The software engineers should not be blamed for the MCAS fiasco. Aerospace software development follows very strict life-cycle processes with multiple independent checks and tests. But these processess only ensure that the software meets the requirements. If the requirements are wrong, so is the software. The flight control system and safety engineers were responsible to require a cross-check of sensors. But they did not. Because the MCAS was only supposed to have limited capability to move the stabilizer. Therefore, its malfunction would never be hazardous. The problem appeared when they incremented the MCAS limit during flight tests. And also when they forgot to specify that the MCAS should not be activated multiple times. These later changes and omissions made the MCAS hazardous. Bad requirements and missing requirements are the nº1 problem in the development of complex aerospace systems. But software engineers should not be blamed for that. We (system and safety engineers) sohould carry the blame. Certainly a relatively delicate sensor with external moving parts is a super obvious point of failure that any engineer would flag down instantly. Sometimes in industry what happens is you are updating a system or product, you don’t want to re-certify your electronics (to make schedule or cost) , but you used all the input capacity on your logic systems/comms/wiring and still need more. So you have to “get creative” squeezing functionality into your legacy electronics. I really hope it wasn’t something like that. ISTR that there was a crash in South America a few years back because both artificial horizons were getting info from a single pitot tube that had been taped over when the plane was being washed. The thing is, there was a switch in the cockpit to select whether the dual instruments were both using the left pitot, both the right one, or one on each. Using two sensors is not a new idea. I mingled two accidents in my mind. As a business owner who also happens to be a pilot and aircraft owner, I’ve been following this fiasco with great care. While not widely reported, Boeing submitted a software update to the FAA back in January. They’re still dragging their feet and as a consequence, folks needlessly died the EA crash. To those who would say, “Nope, this is all on Boeing and the FAA for letting them run roughshod over the regulations!”, let me share a bit of news with you to help you grok what dealing with the FAA is like. Did you know AVGAS (aviation gasoline, e.g. the fuel used in the entire piston-powered fleet) still has lead in it? This, decades after MOGAS (motor vehicle gasoline, e.g. what we buy for our automobiles) was banned from using tetraethyl lead (TEL) as an antiknock compound! Yet there’s a drop in replacement available. Drop in meaning, refiners like Shell, Mobile, et al can begin mixing and distributing it using existing pipelines and trucks without so much as having to first clean the equipment or change anything whatsoever. So why isn’t it used? It’s because the FAA has been dragging their feet on approval. Put another way, the FAA would rather people continue being adversely affected by lead in the environment than fast tracking this. Source? I know the owner of the company, and stand up guy if ever there was on, plus I’ve got friends who have flown with this fuel – extensively to help with testing. Bottom line? It works! And while there’s speculation this has to do with big oil not wanting to pay the patent holder and thus lobbying the FAA to obstruct permission, I’m not going down that rabbit hole. Suffice to say this stuff has been available for years and the patent clock is running down so you figure it out. Me? I do believe it’s all about the Benjamins and am greatly saddened we’re still damaging the environment when a replacement fuel is available we could begin using by next week! I kid you not. Just to confirm, my town is on the Colonial pipeline that runs up the east coast and one of the local terminal’s operators told me that they do add the lead for avgas here at the distribution facility. Switching to a different octane booster would be quite possible. On the other hand I’m not sure the limited amount of leaded gas used by prop planes should be considered that big an environmental hazard (perhaps as someone who hangs around airports you feel differently). Multi product piplines ate commonly used in the oil industry. There are two methods for seperating differe t products, pigs and turbulent boundaries. The amount to product mixed is in the order of 20 to 40 gallons in thousands of gallons, which hadly affects composition or octane levels. Just reporting what I was told by some guy who operates the terminal. Presumably avgas (not the kerosene jet fuel) is needed in such low quantities that they mix the lead in at the distribution yard. This is what I have heard also. Actually in New England I have heard that lead isn’t added to make avgas until the storage tanks at the airport are filled. The quantities are so low that even the fuel distribution terminals(in NE supplied by ship not pipeline) don’t even want to deal with it. –I’m guessing that sort of safety practice wasn’t inculcated into the software engineers in the same way that it was for old school aerospace engineers. Software is often a poorly documented, partially tested black box. I’ve worked in the SW industry for many decades, though never on safety-critical applications. I do know that writing safety-critical software requires a completely different mindset and approach from writing normal commercial software. There is no way to verify by testing that software is safe, so safety needs to be designed in. Things we normally take for granted, like dynamic thread and process scheduling or intertask communication that perturbs timing, must be avoided and everything needs to be extremely deterministic so you can be confident the software works as expected “just by looking”. This is scary to me since (a) the number of people who know how to do this is small, and (b) the normal industry practice of patch-patch-patch can easily break something. And of course the work must be done with thought and care which is in short supply on crash programs where bonuses depend on delivery. Obviously there are people and organizations that can do it and do it well, but it clearly requires a body of skilled and experienced workers and this is not compatible with the current corporate fetish of ever-changing outsourced and precarious staffing from this year’s lowest-wage area. Even scarier given this background is what we now see as a tendency to “fix it in software” when problems emerge from earlier in the design cycle, something that apparently happened in the 737 MAX case, but also, notoriously in the F-35 fighter and a million other programs past and present. Somehow the idea has taken hold that this is cheaper and easier than fixing the original problem, but it is usually slow, costly, and unsatisfactory, and resulting in a “distressing whole”, i.e., a kludge. Software engineers can help here by pushing back on proposals to make the system software into a band-aid for other system problems. This is not always welcome, but is usually the right thing. Mention of the Flying Swiss Army Pocket Knife reminds me, I read a lengthy report from Project On Government Oversight (POGO) on the latest status of the F-35 Forever War. I find it shocking that the F-35A, the Air Force version, which is supposed to provide ground support, only carries 183 rounds for ist 25 mm. cannon. The A-10 carries 1,350 for its 30 mm. In addition, the F-35A doesn’t shoot straight, so ground forces would be suicidal to call for close support. Their solution to the problem? Cancel the gunnery tests. They rigged the tests of course. But the Air Force hates the A10 because it is for ground support and is not a fighter and has been trying to kill it off for years. Pity they could not just give the A10s to the Army and let them fly it. No point trying to give it to the Marines as their command has drunk the F-35 Kool Aid. Air Force fights hard to protect its turf, will never give army a plane, even one af doesn’t want. The very idea of using the immensely expensive F-35 for close air support is insane, of course, even if it worked, but it doesn’t. Trim systems have been a part of airplanes from the earliest experiments with powered flight. They can be as simple as a bungee cord pulling on a stick, or as complex as multiple computers interacting in a *fly-by-wire* scenario. Pilots have to demonstrate more than awareness of these systems; they must demonstrate competency in their operation and oversight.They have been trained in how to identify, override, and compensate for malfunctions in any misbehaving flight control system in the aircraft for which they receive authorization. One big unknown here (in my mind) is whether a malfunctioning trim system would (or should) have been obvious to the flight crew. Another other big question is whether means of deactivation (not speaking of *override*) of the system was the same as in the previous 737 variants. Typically; this might involve pulling a labeled circuit breaker to remove power, and then manually adjusting a trim wheel on the console; or near the flight controls. The history of aircraft design and flight testing is full of unanticipated complications; frequently addressed by tweaks to details of structure and/or operational limits. The goal is to cover all possible permutations of problematic interactions of aircraft; environment, and human beings. There is a great deal of precedence in this topic. the phrase *due diligence* comes to mind…. Boeing changed it. The old trim system had a cutout switch on the yoke. If pulled back hard enough, it would shut off the trim. They removed this for the Max, hence the pilots wrestling with it into the ground. No it was still there, all that happened when the cutout switch engaged was the system reset itself (zero’d out how far it had already trimmed, re-read the errant instrumentation, and proceeded to push the trim another 2.5 degrees). It would have actually been better if the cutout switch had been removed, because the aircraft may been save-able at 2.5 degrees max trim. With the cutout switch tripping the reset, the trim went the the max mechanical limit, with no way to counteract it in time. What the folks at Boeing may not realise is that the more they double-down on this bizarre tactic of using spin-doctoring as a crisis management tool aimed at an audience that is rapidly losing trust in the company ( and frankly may no longer believe anything coming out of the corporate communications department at Boeing), the harder it’s going to be to reverse course by coming out and saying “we screwed up and will do whatever it takes to fix this”. This debacle has all the makings of a large scale cover up and the continued mala fide attempts to deflect focus away from taking ownership of and accountability for this crisis will only result in continued assault on an already battered reputation. As an aside, the malaise at the FAA has been much documented on these pages and elsewhere recently, from the egregious abdication of its regulatory responsibilities to Boeing to having a top position go unfilled for over a year, my question to US readers is whether a comparable level of capture by corporate interests has similarly defanged the FDA? I only ask because I see a lot of supplements and other medicinal products sold here in South Africa with the “Approved by the US FDA” seal of approval and wonder whether deferring to US regulators by international regulatory bodies is still a good idea under the current climate. Currently, the FDA mostly relies on the industry to police itself, only sporadically inspecting manufacturing sites. That approach has been strained by the increasing proportion of generic drugs and drug ingredients made for the U.S. market in countries like China and India, where the regulator has few boots on the ground. Another safety-critical industry that is being allowed to “self-police”. Based on above documentary , FDA is suffering from same regulatory capture like other US regulators such as revolving door , misuse of very old legal provisions , heavy lobbying to the politicians , refusal by FDA to ban medical equipment which is banned by most countries for being harmful to patients, etc. It is a real shame, because as recently as the early 1980s, the FDA was a vigilant and respected agency….not unlike the SEC, which has underdone a similar steep decline. Obviously, the solution is to privatize the FAA; along with ATC, the FDA, the school system, police–RoboCop anybody–and fire departments, etc. The following statistical categories might generate interesting numbers. #2: Same for Max variant in question. Boeing is too big to fail. Shareholders should care. It is conceivable for Boeing to go bankrupt, but the company would be salvaged as a matter of national economic security. Like Lehman Brothers so to speak. Anybody else notice that Boeing has at least muzzled the CEO since he made the statement “make a safe airplane even safer?” They are at least keeping their mouth shut now, but at this point actions speak louder than words because frankly nobody is going to listen to Boeing words anymore. Not if the relative stability of the stock price is any indication. Flight simulators are expensive and scheduling will likely be backed up, given the large number of existing and planned 737 Max aircraft. It’s an important problem to fix, but not with the current workaround, which seems to be to use a tablet computer instead. One would think a tablet computer would be a poor platform for a computer game, let alone to simulate flying a commercial aircraft with new s/w or h/w, the flight conditions under which they fail, and how to respond to them. All a tablet computer could simulate is turning the pages in the flight manual. Your note should be a useful reminder to the current generation of executives at Johnson & Johnson. They and their peers at other companies seem to have discarded the crisis management gold standard established by J & J during the Tylenol scare. It is cheaper, it seems, and provides fewer avenues of attack for the tort bar, to substitute scripts provided by the apology industry, which can trace its origins to that same Tylenol scare. Somehow, reading Naked Capitalism, we keep seeing these problems. The zombie company run by a smothering of MBAs (collective noun taken from yesterday’s suggestions by Wobbly Telomeres). The unwillingness to pay taxes and the convenient move of corporate HQ–much as feudal lords wandered among their demesnes and molested the commoners. The breaking of unions. The destruction of the craft / engineering side of a business, so that everything is now of the quality of a crappy polyester t-shirt. The cost-benefit analysis, which Continental Europeans regularly satirize as an Anglo-American peculiarity and deficiency. The idea that code is king–even when it kills off a bunch of inconvient brown people. The limited-liability company as criminal syndicate. And Boeing isn’t too big to fail. Lose enough orders and there you go—into bankruptcy. This is a “problem” for a manufacturer run by a smothering of MBAs who disdain manufacturing. Question: I read that Boeing has ceased production of the 747, widely considered the best-designed aircraft ever. Was this due to another managerial, errrrr, oversight? If you asked at the Pentagon, I think the consensus would be that Boeing is TBTF. It is not too big, perhaps, for the typical corporate bankruptcy reorganization. I believe the 747 is still being used for air cargo. The last 747 variant was pulled from passenger service in 2017. The wiki entry is overly elaborate. That it describes catastrophic air crashes as “hull losses” might suggest who has been editing the entry. Hull loss is the standard industry term when an aircraft is written off. Nothing nefarious. Go check all the other aircraft entries, or any aviation media when they discuss crashes or incidents. Also, there are still 747 variants in production, and Boeing has years of orders on the books. Hundreds of existing planes are still in regular passenger service. Stop making things up. The “hull loss” reference is followed by the number of dead passengers and crew from those crashes. When speaking of equipment lost, such as twelve Caterpillar tractors were lost in the train wreck, I have no problem with the usage. In the context of the heavy loss of life in the crash of an airliner, it is a euphemism. As was so elegantly pointed out, I misspoke. The last **US** carrier stopped using the 747 for passenger service in December 2017. Foreign carriers continue to use it. Over the past several years, Boeing has frequently signaled that it will stop making the 747. It still makes about six per year, with 24 unfilled orders. Most are for freight. For context, before these two crashes, according to Boeing, it had more than 4600 unfilled orders for the 737, nearly 80% by number of its outstanding orders. It had 632 orders for the 787, and just over 600 for all other commercial aircraft combined. Of course they did. Killing their union has been a primary goal for years now. That goal completely @ssed up the 787 development (years late) because of outsourcing. And because the 787 ate up development time, the replacement for the 737 was delayed, and the Max was the result. What I can’t do is forgive the team members who did not take action after the first crash. After looking at the black box logs, they surely could have run some sims on a haywire single AOA sensor and would have seen the various bugs in the system. (There’s every indication that this is true since Boeing has been working on an update for months.) At which point, I’d like to think that I would have risked my job and possibly gotten fired and likely worse by going to the press and insisting the airplanes be grounded, at least until the patches we would have been making could be tested, certified, sim trained on pilots, and, finally, deployed. Fortunately I don’t work on software that can kill people, otherwise I likely would have already had my conscience forcing me to choose between eating and sleeping peacefully. Management focuses on outsourcing, hiring the cheapest, least experienced people, and telling them as little as possible. So how is it the developer’s fault? The developer has their family livelihood on the line — they are instantly replaceable and know it thanks to rolling layoffs. Management decides, management creates the environment where nobody knows enough to object. There’s no institutional knowledge, no personal experience, language and culture and timezone impediments, and management likes it that way because it’s cheap and no one argues with them. And they get what they wanted: deniability and a quarterly bonus. Nobody at Boeing is going to pay any personal price for this. Almost 400 people are dead and no one at Boeing will go to jail. Go ask Wells Fargo about personal responsibility. Go ask Volkswagen where they blamed everything on a low level engineer. A guy I graduated with got hired out of school to write software for health devices. He quit after a couple of years, couldn’t handle the stress of live animal testing. I wouldn’t characterize him as a particularly sensitive guy. He didn’t say it but it was pretty clear he was unhappy with the testing protocol. Anyway, he moved on to work on a POS system that several years later suffered from a very major, very public hack. I guess I’ve been lucky compared to him. Siej’s point concerns actions AFTER knowledge of the first disaster. RE: Boeing Doubles Down on 737 Max, Rejects Need for Simulator Training. Isn’t Boeing essentially a defense contractor with a civilian aviation branch? Perhaps the civilian branch goes away and the real business—weapons—continues nicely. – Boeing’s commercial backlog was reported as $490 billion. Seems like Boeing prefer the “Mayor Larry Vaughn”(Jaws) school of crisis management. Thank you Yves – a really good summary of this mess. Just as in your prediction, China has ordered a bunch of Airbus planes. That didn’t take long. I’ve got that dejaVu feeling all over again… Detroit anyone? That’s the lesson we failed to learn – that excellence is the only thing there is. Manufacturing and technology are here to stay and whoever does the best, most reliable job gets the prize. Kludge doesn’t cut it anymore. This really makes me ill because we’ve been kludging for a long time. It could be intentional, or it could be coincidence. China has many irons on the fire and a long term view (or so they say). One factor every very large organization considers is spreading it’s business a bit to avoid sole-sourcing, which carries with it a number of risks. It is in China’s interest to have at least two sources of this class of aircraft, at least until it gets its own manufacturing concern on solid footing. Yet is a curious bit of timing. It was the second 747 to be delivered to Lufthansa. It made its first flight on 30 March 1970 and was delivered to Lufthansa on 13 April the same year. As the aircraft was making its takeoff from runway 24 … in Nairobi, the pilots felt a buffeting vibration. The captain continued the climb and retracted the landing gear. However, as this was being done, the aircraft started to descend and the stall warning system light came on. The aircraft continued to descend and approximately 3,700 feet (1,100 m) from the end of the runway, the 747 grazed bushes and grass. It then struck an elevated access road and broke up. The left wing exploded and fire spread to the fuselage. 55 of the 140 passengers and 4 of the 17 crew members were killed. The cause of the crash was determined to be a stall caused by the leading edge slats … having been left in the retracted position… As a result, the aircraft was unable to climb out of ground effect. The flight engineer was found to have failed to open the slat system bleed air valves as required on the pre-flight checklist. This prevented bleed air from flowing to the 747’s pneumatic slat system and, since the leading edge slats on the 747 are pneumatically driven, kept it from deploying the leading edge slats for takeoff. The take-off warning system that would have sounded an alarm due to the flaps not being lowered did not have a separate warning that the slats’ pneumatic valve had not been opened by the flight engineer. The faulty state of the slats should by design have been indicated by yellow warning lights: one for the pilot, and eight for the flight engineer. However, both crew members stated in court that these lights had been green. Three possible explanations have since been offered for this inconsistency: that the morning sun was blinding the cockpit crew and thus hampered color perception, that a construction error could have caused green lights despite the retracted slats, and that the crew lied. None of these possibilities could be conclusively proven. The flight crew was blamed for not performing a satisfactory pre-take-off checklist, but the accident report also faulted the lack of adequate warning systems which could have alerted the crew to the problem, Two previous occurrences of this error had been reported, but in those cases the pilots had been able to recover the aircraft in time. After this third, deadly incident, Boeing added systems to warn pilots if the slat valve had not been opened prior to takeoff. Thankfully, back then, we didn’t have the internet to generate instant rage and call the 747 an “unsound design”. Let’s see what the investigators say; the real ones, not “people briefed on the matter”. Supposedly the Ethiopian report is due next week. Most likely, they’ll all point the finger at each other. Actually, Southwest has a very good safety record. One of the reasons, IMO, is that they use only a single type of aircraft throughout their airline, the 737. This simplifies operations, ensures pilots are always on familiar equipment, and makes maintenance and spare part logistics vastly easier and more reliable. Obviously, having a “new” 737 that was “the same” as their existing fleet was vital to this whole strategy, so I can see how Southwest was insistent on the point in their contracts with Boeing. However, Boeing should either have never agreed to it, or should have actually done it. They appear to instead have pretended they did it. Based on what standard? Compared to Lion Air? Just off the top of my head, since the early 2000’s or so, and I’m probably forgetting a few incidents, I can recall two runway overruns, both times hitting gas stations strangely, and one of those times they killed a child in a car. I can think of two explosive decompressions caused by metal fatigue related to improper maintenance. There was a nasty scandal where it came out Southwest had been bribing their FAA inspectors to look the other way while they whipped maintenance logs. There was the flight in Missouri that landed at the wrong airport recently. The aircraft was thankfully able to stop on the extremely short municipal runway, but it was pure luck no one died. There was the nervous Captain that attempted to take the controls from a First Officer during a landing and then hit the ground so hard she collapsed the gear at La Guardia. Last but not least, there was the very recent catastrophic, uncontained engine failure that lead to another explosive decompression and the gruesome death of a passenger. The fact they you think they have a good safety record goes to show you just how good Southwest is at PR and how bad our press is at journalism. After the most recent Southwest disaster that left one passenger dead there was no critical coverage of Southwest’s troubling record of maintenance violations and explosive decompressions, just a bunch of feel good stories about how the Captain who successfully landed the plane was, gasp, a lady, and OMG a ex-Airforce Pilot, and bless her sweet heart, a Christian!!! How relevant. Thanks for the reporting! Of all the major US carriers Southwest has the worst safety reputation among those in the aviation community. I’m not saying I wouldn’t fly on them (I never have actually) but their safety record absolutely does not inspire confidence. Attitude at Boeing initially was that a couple of Third-World airlines employing – you know – those sorts of pilots carried major responsibility for the crashes, until black-box recordings clearly showed acute problems managing the MCAS…it went south after that, as the ST article show. “Crisis management consulting firms”…whenever I read that, my BS sensor starts to red-line. Even if the operators survived, the are usually lone individuals, often traumatized, and are easily discredited by high priced lawyers an PR firms. “Operator error” magically and beautifully shields all the other players from liability or blame, and means no changes need to be made to the existing operation, physical plant, equipment, or regulations. Maybe some inexpensive “better training” is needed to make sure the pesky operators don’t screw things up again. It’s a perfect finding if you can get it! I completely agree the 737 Max was a deeply flawed product that should not have been in service, but Indonesian airlines and Indonesian pilots have a horrible reputation. It’s a real thing and not’s just racism or western superiority. At one point in my career, feeling stuck in my career and desperate to escape the purgatory of being a high-time US regional jet captain, I considered a direct-entry Captain job at Lion Air as an expat. I had traveled a bit in Indonesia, and besides the sub-standard pay it sounded pretty good to me. After a few inquiries to friends on the expat flying circuit I was warned away from it by everyone that had any first-hand knowledge of Lion Air or Indonesian airlines. I heard enough I chose not to pursue the opportunity. I seriously doubt any airline pilot in the United States would have taken the Lion Air 610 aircraft airborne with the extremely troubling and unaddressed issues it contained in its logbook, but 737 airline pilots in the US know they have a union standing behind them if they refuse to fly a plane with serious unaddressed issues. The doomed Lion Air pilots didn’t have that luxury, and sadly the passengers did not either, but the write ups were scary enough I might have refused the airplane job protections or not. The 737 Max may have been a deeply and fatally flawed airplane but that doesn’t mean the first fatal crash happening at an airline with a horrible safety record was a coincidence either. Safety culture relies on multiple layers of checks to catch and mitigate dangerous situations much like good systems engineering contains multiple redundancies for critical systems which require multiple points of failure before a system is compromised. Lousy, developing/world budget airlines, which typically lack unions (which allow pilots and mechanics to push back against unsafe management demands) and good safety-culture role models among the pilot and mechanic ranks are particularly vulnerable to the risks involved with operating dangerous or flawed airplanes. Their defenses are simply not as robust. This may be a bad analogy, but airplanes are inherently dangerous: pressurized metal tubes filled with human flesh and kerosene, rocketing around the atmosphere at very high speeds. Guns are inherently dangerous for obvious reasons, they are made to kill. A gun should always have a ‘safety’ or a trigger lock mechanism. But… if you were going to give a gun with a broken ‘safety’ a.k.a. trigger lock to a person to use for target shoooting, would it be more likely to be involved in a fatal accident with a very careful and well trained marksman who was always careful never to point his unloaded, safety-locked gun at things he didn’t intend to shoot or another less disciplined marksman who was frequently careless with his weapon and figured his gun’s safety lock mechanism would keep him out of trouble? Not an entirely fair analogy, but I think you get my point. Bad habits, bad safety culture can compound danger just as good habits and good safety culture can mitigate danger. Note the date and the airline. You missed my point entirely. Indonesian pilots smoking crystal meth is only the tip of the iceberg, it’s a symptom not an underlying cause of their aviation safety woes. My comment dealt with safety culture, habits, procedures, unions backing employees who report safety violations and who refuse to do dangerous things at the behest of management. Somehow you only locked onto the meth angle and ignored the main thrust of my comment. Druggy pilot or dodgey plane? That’s a ridiculous question don’t you think? They’re both bad obviously and no one anywhere is scratching their head right now trying to figure which to choose. I recall a conversation with a few pilots and they told me the key problem with Asian airlines – and this includes the good ones in Korea and Japan, is the culture of never questioning authority. This is good for a smooth running organisation, up to the point where someone (either a captain or a manager on the ground), issues some dangerous or stupid orders. Perhaps you can confirm this, but I’m told there are simulations carried out where a senior pilot does systematically stupid things – the test is to see at what stage the junior pilot starts refusing instructions and challenges the captain. I’m told Australian and Irish pilots are usually first to challenge, Korean pilots consistently at the bottom. Certainly looking at the Ethiopian Airways flight, early reports indicate there were problems with the plane on the previous flight, but either they thought it was ok, or the pilots didn’t feel they could over rule company pressure to keep the plane in the air. crash where the plane famously rolled-over above a Taiwanese highway as it crashed. I’d rather go down knowing the Aussie pilots were having a wee biffo up front. Never worked there but I’ve spent a a bit of time there. I have a lot of friends that have worked as expat Captains or sim instructors in China. Not really the stereotype I’ve heard. That’s one of the things I like about the Chinese, they’re a spirited bunch and they will raise hell if they think something is out of order. That Tawainese Dash-8 crash you referenced I believed was chalked up to being more of a pilot skill problem, but I have flown out of that airport as a passenger, and that crew was dealt a bad hand. Not an easy emergency they had. I’ve never flown in Asia, but from what I’ve heard from people who have is Japan and Korea both have a problem with meek First Officers and ego maniac Captains. I wouldn’t say the same problem is particularly acute in Southeast Asia, as those cultures are radically different from the Japanese and Koreans, but ego maniac captains can be a problem anywhere. It was one of the main factors in the worst air disaster of all time, two 747’s colliding in Tenerife. The KLM Captain famously involved in the disaster was a literal poster boy for the airline and the chief flight instructor at KLM. The CVR revealed the First Officer and Flight Engineer had misgivings about the take-off clearances but failed to challenge the celebrity, ego-crazed Captain. Boeing has announced a new feature for the 737 Max. It is a new implementation of an old technology, FbyF. Boeing is taking the step to ensure that the flying public can have complete faith in their transport by Boeing Products, and that each flight continues to generate generous contributions for every miraculous safe flight. For the faithful, for those who believe, it’s cheaper to fly with Joseph of Cupertino, the levitating monk. Two paragraphs more than 700 pages into a manual does not qualify as anything approaching adequate disclosure. Over some semesters, I have just about memorized some textbooks during the months of reading and re-reading every single page with pen, notes, high-lighter, coffee and music at hand. Even so it would be easy for me to miss a paragraph or two. Some of these pilots apparently had only a few days or even just hours to read the tome. There was no disclosure and it is a lie to say differently. Ho hum… Another poster child for the failure of neoliberalism with its deregulation and absolutist elevation of market prices as the sole determinants of corporate value. Senior management and Wall Street successfully played for short term stock price elevation and their own personal wealth through stock options supported by formerly illegal corporate stock buybacks funded from operating cash flows and increased debt leverage. Boeing now has negative tangible shareholders’ equity and a narrower set of funding options to work their way out of this mess short of divestiture/merger or federal subsidies, whether direct or indirect. But first I expect we will be treated to a typical “Punish the Innocent” layoffs phase. Appreciated Yves’ mention of the transfer of the corporate HQ out of Seattle as a contributing factor. Represents more than physical distance separation from the kids who brought you and the real drivers of long-term corporate success. Too, there is some question in my mind whether the line to willful negligence was crossed that led to the two tragic accidents. Separating C suiters from everything else in the corporation seems to have been a trend for some two decades. I have seen the trend repeated at group and divisional level. The physical distance produces intellectual and emotional distance by removing decision makers from the consequences of their actions. That makes it easier to manipulate employees, communities, suppliers, the environment, etc. There’s also a lemming aspect to it. Large companies use many of the same consultants, who often sell the same solution time and again, as if it were specially crafted just for you. Apart from being safer, more convenient and comfortable, it helped persuade generals at a loss for how to wage war at an unprecedented scale and with much more lethal weaponry that they could deploy over and over strategies and tactics that were plainly not working, except to populate the graveyards. IMHO there’s a Pulitzer Prize awaiting the Seattle Times and its excellent staff reporters for the exceptionally thorough, sound, and meticulously sourced reportage done on the entirety of the 737-MAX MCAS debâcle. In the era of “fake news”, RussiaGate, and the lot, the efforts of this newspaper to get out front of a critically important story deserve kudos from all of us in the “reality-based” community. Agreed, the Seattle Times’s coverage of this debacle has been really good. The Seattle Times has a history of covering aviation topics well. They covered the Alaska Air Flight 261 crash very well. In trying to learn more about the 737 Max crashes, I stumbled across this excellent documentary on their 787 model. https://www.aljazeera.com/investigations/boeing787/ Ten out of fifteen workers at the assembly plant in Charleston, SC wouldn’t fly in the plane they’re building! If you check out the documentary, then what happened with the “Max” makes perfect sense. Bottom ilne, the bean counters have taken over the company; safety be damned, and I wouldn’t fly on either plane. The new more “efficient” engines on the Max caused the plane’s center of gravity to shift, something the MCAS system is designed to counter. And the problem was much worse than reported to the FAA; 4x worse. Problem is, garbage in-garbage out; if the angle of attack sensor isn’t working properly, that one errant part can cause the plane to crash as we’ve seen. Brown says the opposite here. He’s a pilot and I’m not, though. Juan Browne does an excellent job of explaining very complex topics. Not just aviation-related, but on the ground. I commend his Oroville Dam coverage to the commentariat. And his coverage of the Camp Fire, which wiped out Paradise, California. His technical analysis of the crashes has been invaluable. I appreciate the excellent analysis. The current system (“greed is good” and consolidation into multi-national monopolies) has come home to roost. Boeing is America’s too big to fail defense contractor and aircraft manufacturer. It literally cannot do the right thing; the drive for bonuses based on short term profits means the company cannot require fight simulator training because they would have to pay Southwest Airline 292 million dollars for contracted 737 Max(s). Also, it would be tantamount to admitting to criminal negligence which could cost much more even for a Chicago based company. On the top of this is the globalist push to diffuse national sovereignty. The FAA is neutered. The 737 Max will carry passengers again in the USA but could well become a symbol of Americans’ lost trust and give rise to “Anti-Maxxers” who will never fly in a 737. Europe and China have every reason to drag out re-certification. In an unstable world with a Cold War between Russia and the West and far too many forever wars, the loss of the last major manufacturing industry and the demise of the United Kingdom will nose drive the Atlantic Alliance into a hellish sea. And so what kind of bullcrap systems are inside Boeing’s defense products, where there is *even* less accountability and zero concern for the safety of the “grunts” who have to use them in war situations? Not to mention their targets. Well there’s this problem with the Pegasus tanker that could damage the stealth coatings during aerial refueling. Then they had a problem with mechanics leaving tools and debris inside of the tankers they were working on. That led to the Air Force telling Boeing that they weren’t going to accept any more tankers until Boeing stopped leaving tools inside of them. Boeing’s engineering and quality have been declining for years. A few years ago I was up at the Flying Heritage Museum at Paine Field in Everett, which is by Boeing Everett. At the time there were lines of 787s sitting on the tarmac by the Boeing plant. I asked a friend who worked at Boeing about them and he told me that they were there for rework. These 787s were built in Charleston but the non-unionized workers at Boeing’s wonderful new South Carolina plant couldn’t install wiring harnesses properly. This really annoyed the airlines who were buying these planes and they stopped accepting them. So the 787s with bad wiring were flown to Everett where unionized workers fixed them. I guess that no one at Boeing had ever heard the old saying “you get what you paid for” or never had their father or their TC or their platoon sergeant say “Damnit! If you don’t have the time to do it right when are you going to find the time to do it again?” Of course while these planes were being reworked Boeing wasn’t getting paid for them, which is a huge capital cost. I hate seeing what’s happened to Boeing because I used to love that company. I used to drive down East Marginal Way in Seattle by Boeing headquarters and feel a surge of hometown pride that this was where the B-29, the B-52, the 707, the 747, the first stage of the Saturn V rocket and many other aviation advances were designed. I know I’m not the only one who felt that way, but not any more. It’s even worse when you consider that if Boeing hadn’t drank a whole bunch of outsourcing Kool-Aid served up by overpaid consultants with MBAs that they could have produced the 787 faster and for less money which would have left them with the resources to design a clean sheet replacement for the 737 and that they still would have been a very profitable company while doing so. Do you expect the big dogs to rub shoulders with the knuckle dragging grease monkeys? Even if they once wielded slide rules? Relative years ago confirmed to me that McDonnelDouglas bought Boeing with Boeing money. He was not amused, was a company pilot involved from the B47 through the 767 or so. Stonecipher was a great financial engineer, until he was charged with personal misconduct. Just 2 points on this article and comments: who is GE capital Aviation Services leasing those 25 737 MAXs to? As far as foreign maintenance is concerned, it is common, during overnight layovers for example, for cheapness, as well as expedience to do routine or tasks then. China does a lot, started with Lufthansa. They had a back log of 747 structural modifications to perform. The irony is that while US based A&P mechanics have to fluent in english, the foreign FAA licensed A&P do not have to be. IIRC there was a series of articles years back in the WSJ regarding the english illiteracy of maintence mechs in Central American countries. The Johnson and Johnson example cited in the post demonstrates the concept of what the purpose of a business/corporation consisted prior to the 1980’s. In high school civics class in the 1970’s I was taught that the primary purpose of the business/corporation was survival of the business, jobs, social needs, with profits and dividends trailing at the end of the line. During the Reagan years, the primary purpose of corporations/business mutated to “enhancing shareholder value”. If enhancing shareholder value is the priority, logically then all other purposes, including producing safe products, become less important to the business. And anything that gets in the way of enhancing shareholder value is outside of the business’ scope (ultra vires). So logically, we can never trust any business any longer to do what is right by the public. Boeing is is good example. Ironically, I suppose, but the survivability of Boeing B-17s in WWII was due in part to redundant control systems, with cables running alongside both sides of the fuselage. If an Me-109 shot out the starboard side controls, the pilots could still maintain some control with the port side cables. The B-24 also had redundant systems, but both sets of control cables ran along the same side of the fuselage–I don’t know which–so if an FW-190 or flak took out that side the plane was doomed (and the B-24 was awful in a ditching, whereas the B-17 had a chance). Similar to the DC-10, which had redundant hydraulically-assisted systems, but they were routed in close proximity in the tail of the aircraft. Ask the survivors of United 232 in Sioux City how that worked out. Were these lessons forgotten, or never learned?